The Rocket Man singer, 70, is set to address his fans at an event in London on Wednesday (24Jan18). Ahead of the announcement, a report in Britain's Daily Mirror newspaper claimed Elton is planning to retire from performing live after a year in which he has been forced to cancel gigs due to ill health. According to the newspaper, the veteran singer is considering bowing out after one last farewell tour for fans. The rock superstar spent two nights in intensive care and 12 days in hospital in April last year (17) after picking up a "potentially deadly" bacterial infection. 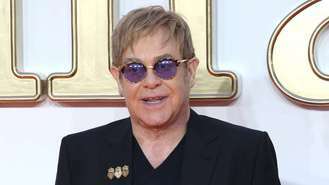 Elton apparently contracted the bug while on the South American leg of his world tour fell "violently ill" upon returning to the U.K. His health scare forced him to cancel all his April and May Las Vegas residency dates. "I am so fortunate to have the most incredible and loyal fans and apologise for disappointing them," a statement released by Elton at the time read. "I am extremely grateful to the medical team for their excellence in looking after me so well." However, the rocker has since returned to complete his residency in Sin City, which finishes in May, and released a new album in November (17) celebrating his 50-year collaboration with songwriting partner Bernie Taupin. Ahead of his "special announcement", which will be broadcast live via his website and on YouTube Elton appeared in 'augmented reality' form at London's King's Cross station on Tuesday (23Jan18). The attraction allowed fans to experience what it feels like to sit alongside the rock legend at the piano as he performs his 1970 hit Your Song. Singer Kid Rock has scored an early court victory in a legal battle over the original name for his new tour. Justin Timberlake is approaching his third Super Bowl appearance as if it's his first performance at the event. Carrie Underwood and Ludacris have teamed up for a new Super Bowl anthem. A song Ed Sheeran co-wrote for Faith Hill and Tim McGraw is the subject of the latest copyright infringement lawsuit. Louis Tomlinson has taken to Twitter to rant about the line-up for the upcoming Coachella music festival. Taylor Swift sold an incredible $180 million (£132 million) in tickets to her Reputation Stadium Tour in just seven days.